Everyone has a morning ritual. Some cultivate it carefully but for most, it’s a subconscious act. An act that begins your day with clarity, focuses your thoughts, channels your energy. It may be as simple as brewing your own coffee or packing lunch for your child, it may even be more elaborate like yoga or something as mundane as ironing your shirt or polishing your shoes. For some, mornings are spent in prayer, a time for reflection and devotion. I have this terrible habit of over-sharing. So in that spirit, I’m going to let you all in to what my mornings are usually like. I usually sleep with my little two year old daughter next to me. Both of us like our own space by the time we’ve fallen sleep but whenever I wake up, I find her clinging onto my forearm like a koala bear. I wake up and stare at her for a while, her eyes tightly shut, knowing morning is near. I brush away her hair, the softest ringlets of black with chestnut brown accents that one can ever lay eyes on. She squirms a little bit as I kiss her cheeks and forehead. I let her sleep in a little bit longer but then kiss her more frequently so that she wakes up with a smile. Once she’s up, the little dynamo can’t wait to get out of bed and run about. Out first stop is meeting Mommy and her little 6 month old brother, both of whom have been up for nearly an hour by now. Both the kids look at each other and smile, the little one squealing in delight after a tummy full of milk. This is when I make my great escape to the bathroom, while Mommy gets the elder one ready for playschool. I spend an inordinate amount of time in the bathroom, much to the annoyance of my wife. But I’ve stopped caring about that and she’s kind of given up on my bathroom habits by now. I sit there, on my ceramic throne, reading. I’ve almost entirely given up reading the newspaper now. All the media that I consume is electronic. I rapidly read all the day’s news and then catch up on social media : Instagram, Twitter and if there’s time, Facebook. Most of the links shared by people and the ones that I’m interested in reading, get saved to Pocket. Finally, when it’s been a while and my feet are tingly and numb, I get off and head for the shower. Most people at home tell me that I shower like a girl. Just because I shower at leisure doesn’t mean I’m frolicking in bubbles and rubbing myself with a loofah. The shower is where I focus. I go through the day’s schedule in my head, get ready for the surgeries lined up, go over some arguments I’ve had with the wife, think of witty retorts and sometimes even get carried away with melancholy. The last bit of the shower, I let the the water pound my face, think about my family, my kids and say thank you, to the universe for being so unnecessarily kind to me. I get dressed, usually a crisp white shirt, occasionally blue (I love blue) and a pair of pants in varying shades, ranging from light gray to charcoal. I choose a tie, usually one in a sedate and saturated tone and occasionally playful like lime green or with polka dots. Set my hair with minimal product, it needs product because my hair is terribly ill behaved. And then, I head down for breakfast. Breakfast is usually something simple. From poha to idlis, depending on the day and some fresh fruit. When I’m on a health kick, it’s usually oats or a simple egg white omelette. I usually like to make my coffee myself. Even if it is something as mechanical as a nespresso machine, popping in that little pod and watching the coffee pour out is a joy. When I’m not pressed for time, I use crushed beans (a blonde roast which isn’t weak) and a French press. I love the way the entire kitchen and the dining area fills with the smell of coffee. It transports you instantly to a happy place, wherever that may be for you. For me, it transports me mentally to Europe. I adjust my white cuffs and settle in to drink my coffee at leisure. The first sip electrifies my spine, it’s as though my nerves, congealed with lethargy after the night’s rest have suddenly come alive and are pulsating. It’s like drinking sunshine. I hate having to rush through my morning coffee and by the time I actually finish it, it’s usually cold. Since I try and limit myself to just one cup a day, I like to savor it. I’m not a great coffee connoisseur, I don’t know my beans or the roasts too well but I do get the romance behind it. And for me that’s important. For some, it isn’t coffee, it’s tea. For most Indians actually, morning chai is a religion. That perfect blend of spice and sweet with just the right amount of milk. And it’s not even about the recipe, it’s about who brews it. Brew it for a little longer and it’s off, ruining the experience. For most Indian middle-aged couples, that morning cup of tea together is the most romantic time of day, despite no word being spoken, faces buried in newspapers. Once breakfast is done, I shine my shoes and leave for work. If I’m in a rush, I use the good old ‘rush brush’ which is a bit like cheating but if I have time, I’ll go the whole hog with the wax and shine. If you’re a boarding school product like me, you’ll pride yourself on how well you can polish your shoes and will always believe that no one else can do it better. So that’s my usual morning routine. And I cherish it. Someday, if I ever meet some of you, I’d be glad to make you a cup of coffee and sit across you for breakfast, without speaking much. Do you have a morning ritual too? I’d love to hear about it. Till then, I hope your morning cup is filled with sunshine, just like mine. 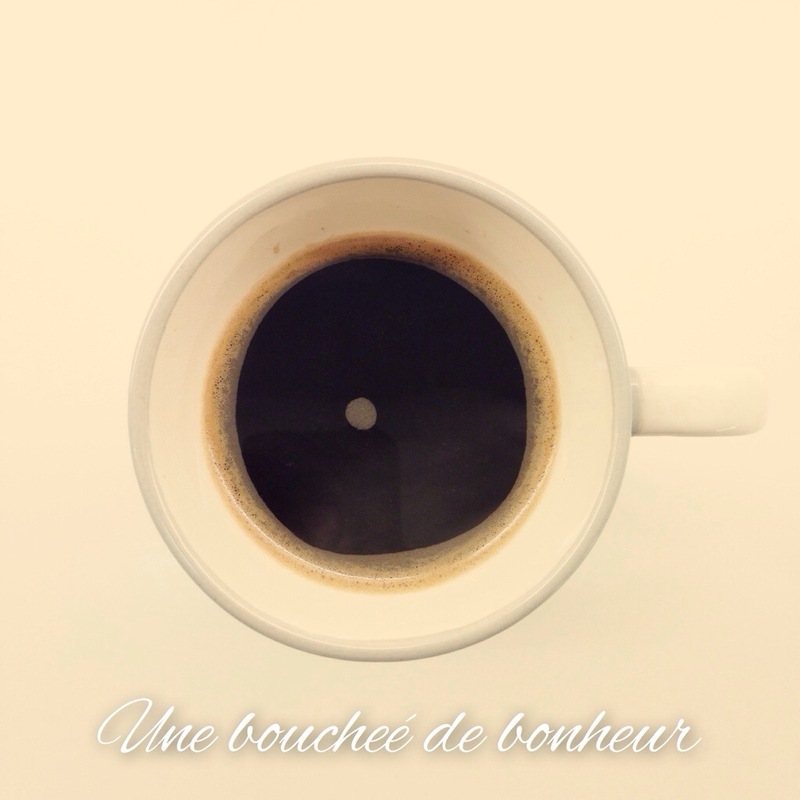 (The picture above, is my cup of coffee this morning, a delightfully wholesome blonde roast, through the French press. The French quote under it translates to “A mouthful of happiness”).